I’m curious about what people refer to as “space security”, as well as space policy and sustainability, and if you’re interested, you can learn with me. This post will just be an introduction to some of the issues involved. Note that I’m not an expert on many of these issues, so take my comments and thoughts with a grain of salt. 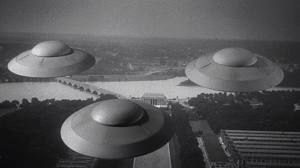 The idea of “space security” might conjure images of invading aliens, but as much fun as that is, that’s not what I’m talking about. I’m also not planning on talking about killer asteroids and dangerous radiation, though these are much less far-fetched. For example, the Pan-STARRS survey (of which I was briefly a member a few years ago) received funding from NASA to assess the threat to the planet from Near Earth Objects, some of which pass closer to us than the moon. (A limitation of Pan-STARRS, however, was that images that happened to contain passing satellites had software applied to black out or blur the pixels in the region.) On the other hand, solar flares can produce “coronal mass ejections” and intense cosmic rays that could be hazardous to spacecraft but on Earth we’re somewhat protected by our atmosphere and magnetosphere. This and other forms of “space weather” could be the subject of another post later. I’d like to talk about the issue of satellites, as well as weapons and reactors, in space. More than 5,000 satellites have been launched into orbit and about 1,000 are in operation today. The act of destroying a satellite or of colliding satellites can damage the space environment by creating dangerous amounts of debris. (If you’ve seen the Oscar-winning Gravity, then you know that debris from satellites can be a serious problem.) For example, in a demonstration of an anti-satellite weapon in 2007, China destroyed one of its own satellites; the resulting “space junk” then struck and destroyed a small Russian satellite last year. 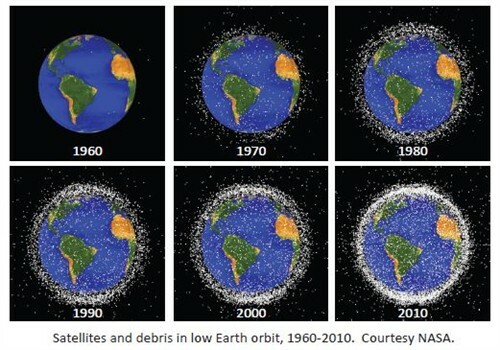 The following computer-generated images of the growing number of objects in low-earth orbit (courtesy of the NASA Orbital Debris Office) illustrates the problem. Only 5% of the objects are satellites; the rest are debris. Currently more than 21,000 pieces of debris larger than 10cm are being tracked, and there are as many as 500,000 additional untracted pieces larger than 1cm. In addition, the loss of an important satellite could create or escalate a conflict, especially during a time of tension between states. The US and other countries possess “anti-satellite” weapons (ASATs) and have or are considering space-based missile defense systems. Attacks on satellites are a very real possibility, and it is important to beware of the destabilizing effects and potential for proliferation with such weapons. Moreover, since the Cold War, the US and other governments have considered deploying nuclear reactors on spacecraft, which have proven to be controversial (such as the dubiously named Project Prometheus, which was cancelled in 2006); an intentionally or unintentionally damaged nuclear reactor in space could have major consequences. Considering that we are increasingly dependent on satellites and that there are military, commercial, and civil interests in space, how can we attempt to ensure space security and sustainability in the future? In the US, the Obama administration has a National Space Policy, which was released in June 2010. The policy mainly consists of: (1) limit further pollution of the space environment; (2) limit objects from colliding with each other and/or exploding; (3) actively removing high-risk space debris. The policy a good start, but much more could be done. An emphasis on international cooperation rather than unilateral action would help; space debris are clearly a global problem requiring global solutions. It is also important to negotiate on the control of space weapons. The US and other space powers should declare that they will not intentionally damage or disable satellites operating in accordance with the Outer Space Treaty and that they will not be the first to station weapons in space. Moreover, “space situational awareness” (SSA), which allows for the coordination of space traffic, can be improved in collaboration with other countries, and satellites can be made less vulnerable to collision or attack. Finally, the US should play an active role in negotiations with the international community on space security and sustainability. The United Nations has the Committee on the Peaceful Uses of Outer Space (COPUOS), with 76 member states, has been working on a variety of programs to improve the long-term sustainability of space activities, and in particular, to develop and adopt international standards to minimize space debris.